Last summer we saw record-shattering shrinkage of Arctic sea ice caused, in part, by human-induced global warming. Last week I listened in on a NASA briefing on polar sea ice, and this year looks no better. This winter was relatively cold due to a strong La Niña, so the Arctic saw a modest increase in overall sea ice (slightly above the record low of 2005-2006, but still below the long-term average). However, the older, thicker ice that lasts through the summer has declined sharply, and this is very worrying. Perennial or multiyear – ice that has survived at least one summer melt season. Seasonal or first-year – ice that typically forms each winter and disappears the following summer. Seasonal ice is thinner than perennial – at most four feet thick versus 15 feet for perennial ice – so it breaks up and melts more easily. Most of the ice cover in the Arctic this year is seasonal. Scientist Walt Meier described this winter’s ice as "a façade" like buildings in a movie set that look solid but are actually empty shells. Perennial ice used to cover 50 to 60 percent of the Arctic. This year it covers less than 30 percent. Very old ice (existing for 6+ years) has shrunk from over 20 percent in the late 1980s to just 6 percent this winter. Left: February distribution of Arctic ice by age, 1985-2000 average. 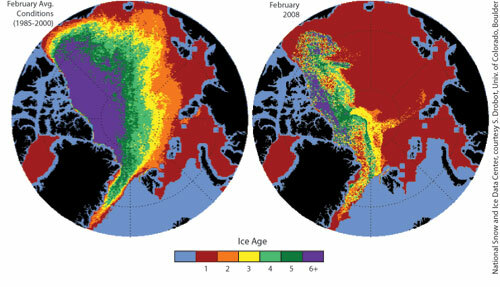 Right: February 2008 distribution of Arctic ice by age. Source: National Snow and Ice Data Centre. The amount of perennial sea ice in the Arctic is at a record low. One contributing factor is last summer’s record melt season. Some of the remaining perennial ice was pushed out of the Arctic by ocean currents, resulting in further loss. The high proportion of seasonal ice means the ice pack is especially vulnerable to melting during the summer season – very bad news for polar bears and traditional hunting societies. One thing to consider on the refrozen sea ice is its’ increased whiteness and thus increased albedo, or reflection of the sunlight. I’ve seen the older ice photos that shows the ice brown or almost black from soot and particulates, so it aborbes more sunlight. But the new ice doesn’t have that much soot yet, so in theory it should reflect more sunlight. Couldn’t this slow down the warming a little this summer? Especially if it’s not sunny and clear as many days as it was in 2007 and if the winds don’t blow out more ice into warmer waters? You’ve raised an interesting point. Older sea ice could possibly have accumulated more soot, therefore having a darker color and absorbing more solar heat. However, ice albedo is affected by many other factors. For example, newly formed ice is grayish in color, and becomes whiter as it thickens. Snow that falls on ice affects the albedo–bare ice may reflect 50-70% of the sun’s rays, while snow-covered ice can reflect up to 90%. To further complicate things, when the snow melts and forms ponds on the ice, the reflectivity of the surface can drop down to 75% to as low as 15%. Ice-free ocean is even darker in color–reflecting only 6% of the sun’s rays. Considering that this winter’s ice area is lower than average, any increase in whiteness of the ice due to a lack of soot is not likely to offset the increase in area of dark water. The NASA scientists said that we’d need a string of cold years for the ice to fully recover. […] radically change the way they live and do business.